Emerging out of the earth, in early to mid-March, bloodroot is one of the earliest spring flowers to bloom in Morris Park. 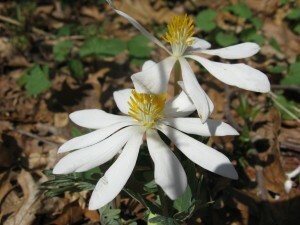 We first discovered Bloodroot growing in a generous grouping of pure white blooming flowers underneath a mass of Japanese Honeysuckle (Lonicera japonica) and Multi-flora Rose (Rosa multiflora). 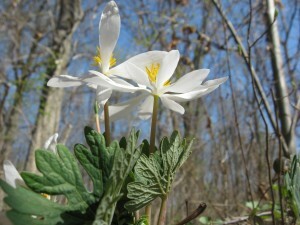 We learned of Bloodroot’s native status to the county of Philadelphia Pennsylvania and of the exotic invasive status of The Japanese Honeysuckle and Multiflora Rose. The invasive vegetation covered everything in the area with a thick matte that blanketed the landscape and was hanging heavy on the nearby small trees and shrubs. The Japanese Honeysuckle wrapped around the young trunks of these trees and shrubs so tightly that it was choking them to the point where they were leaning dramatically and in some cases, they had died and fallen down, only to be completely covered in the honeysuckle, leaving the impression of a lump in a sea of twining vines. Somehow the Bloodroot was still able to grow and bloom in the midst of this alien invasion and as the years passed we began to appreciate this native flower more and more. It is here that we began to try to understand and research the history of this patch of Morris Park, to find out what we were seeing. In our search we began to comprehend the unfolding story of the native North American, Pennsylvanian, West Philadelphian plants, that have existed for millennia right here in Morris Park, and the invasive, non-native plants, introduced in only the past 150 years or even much more recently. As the story unfolded and the evidence became more clear, we decided that the vines producing the very fragrant and lovely flowers of the Japanese Honeysuckle were a true nuisance in the Park. 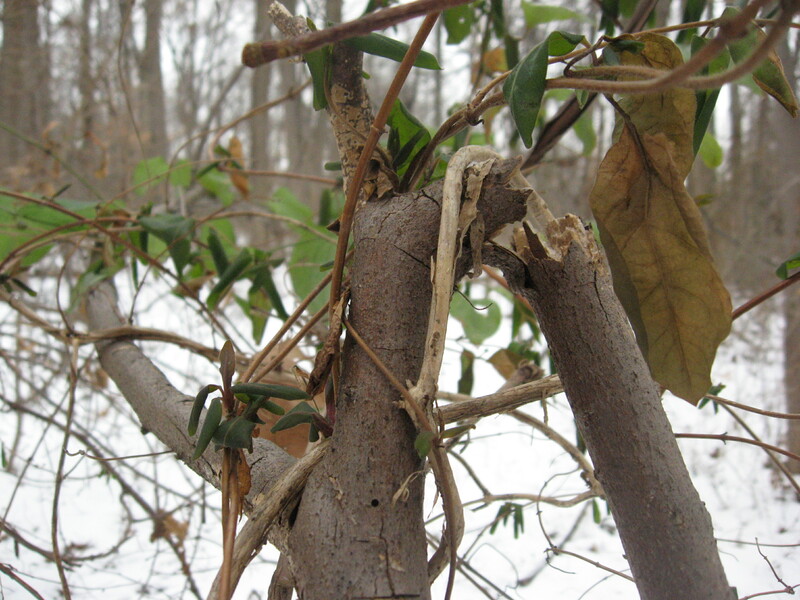 The Honeysuckle plants were growing right out of the Bloodroot patch, completely surrounding it and choking it out. We pulled out the Japanese Honeysuckle from around the Bloodroot patch in the winter of 2007-2008. 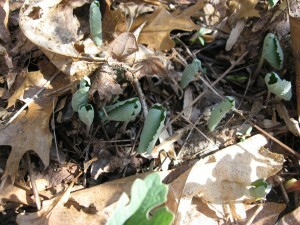 The Bloodroot plants had gone dormant months before but we remembered the location and targeted that area. While we were at it, we pulled out the massive tangle of Multi-Flora Rose that had invaded the area. Since then the patch has nearly doubled in size and the Japanese Honeysuckle is still trying to grow around the Bloodroot. We have been pretty good about pulling it out around the Bloodroot patch in the past few years, however we have quickly learned how persistent this one invasive exotic species is. We have also learned that to succeed in environmental restoration there is a need for consistency, persistence and follow through. 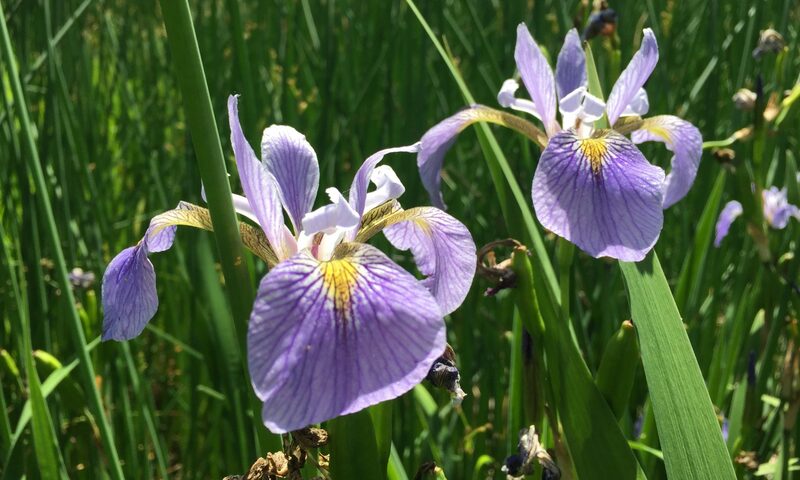 Since this time we have learned the habits of many species in Morris Park, the native and the exotic, and the invasive and the potentially invasive. The Bloodroot plant has become for us our leading star in our adventure into the world of the Northeastern Deciduous Forest, the Philadelphia Urban Degraded Forest and the plants, animals and birds of Pennsylvania. A heightened awareness of nature in our backyard. 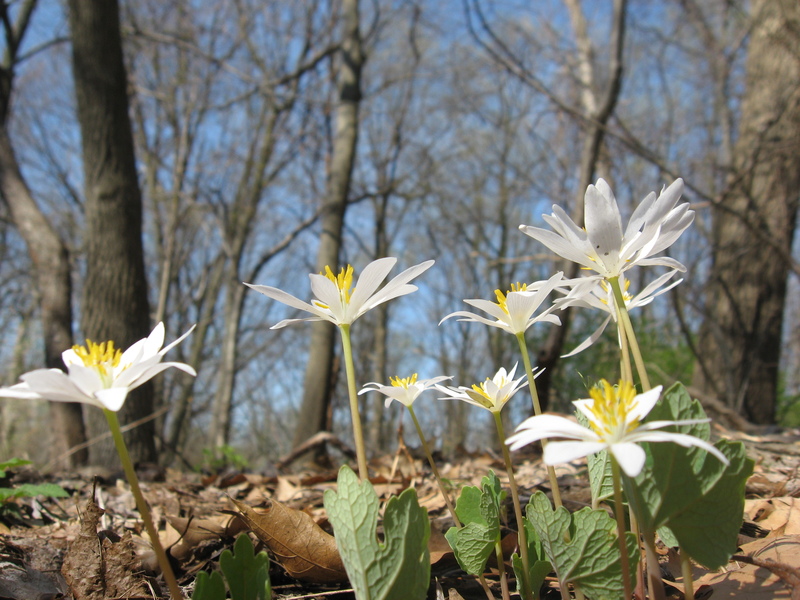 Our most meaningful and long-lasting exercise in environmental restoration began with the Bloodroot flower, growing in the woods just a short walk from the front door of our house. The flower itself is pure white. There are no hints of any other color. It will last a few days, some specimens will even hold on for a week from time to time. 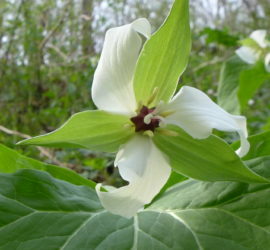 The petals are delicate, and can blow off or be pushed off with the brush of an animal or a spring hailstorm. When Bloodroot blooms, it becomes a loci for bees that buzz around it in a swarm, devouring the pollen and in turn, pollinating the local populations as they go from flower to flower, depositing pollen and picking up new pollen. This is, as we have learned, The recurring theme for the propagation and health of the Flowering Plants. This cross-pollination between specimens guarantees a diversity in the genetic pool. Species require diverse configurations of genetic make-up to survive. So if something goes wrong, there is the probability that a section of the population can weather through the crisis and continue on through the millenia, because they have what it takes to adapt. 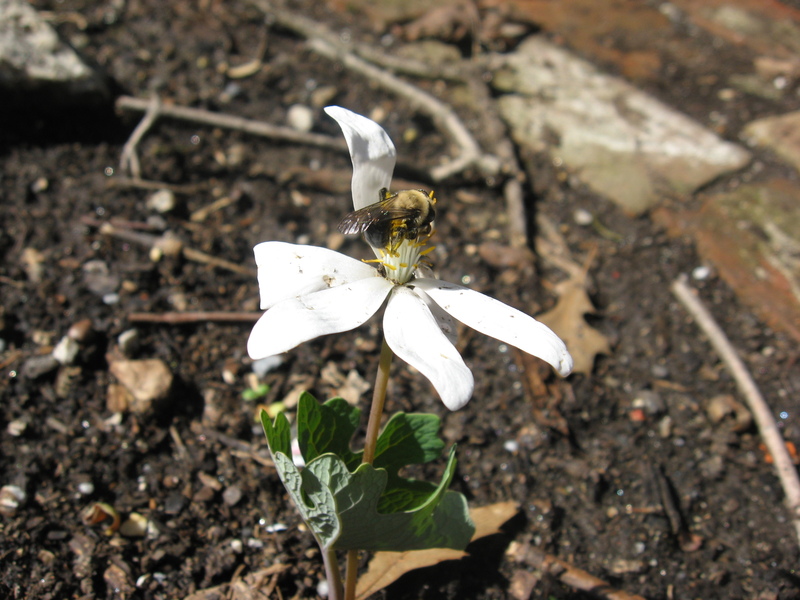 The Bees and other pollinating insects make sure that the Bloodroot plant is constantly being exposed to genetic diversity within its population. The ephemeral flower quickly moves to the business of seed production and the petals fall to the forest floor. Less noticeably, the male parts of the flower, the yellow-orange anthers and the delicate hair-like filaments that support them, wither away. 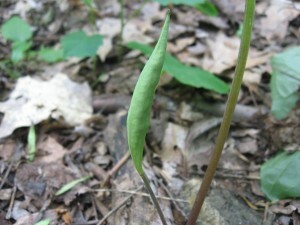 Left is the female portion of the flower, a green elongated pod, with the remnant of the stigma, the pod’s opening which served to allow pollen into the ovarian section. This is the part of the flower that remains. The green elongated pod becomes the seed casing, and the plant will spend all of its energy in the next few weeks in the production of seeds. This simplified description of the Bloodroot flower process can be applied to the understanding of flowering plants in general. To understand the Bloodroot has been our key to comprehending the many other plants in the park. By the end of May, the seed pods have reached a size of over an inch in length and are bulging with seeds. They split down the middle and the shiny brown elliptical seeds fall to the ground, only to often disappear in less than a day. For us uninitiated students, this disappearance was mysterious. However we soon learned that this is a brilliant survival strategy for the plant. According to everything we read, ants were responsible for this disappearing act, grabbing the seeds and hiding them away in their colonies. 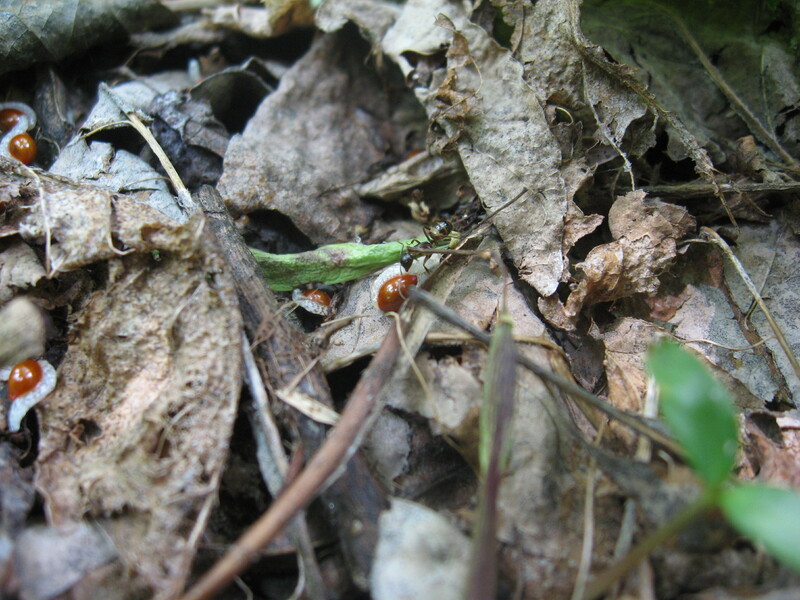 A symbiotic relationship in fact, where the ants eat the nutritious fleshy mane attached to the seed, the elaiosome , while the seed is deposited in a new location, one that is very fertile and ideal for germination, this site being the waste dump of the ant colony, for the ants have no interest in the seed itself, but are willing to haul it the distance to their seed processing facility. One spring day this year, this event was finally witnessed in person, the ants were busy hauling the seeds away, just like in the books and website articles. It was an exciting event. There was some running involved and a bit of chaos involving the need for fresh batteries and the reality of a full memory card, which was quickly sorted out. This long awaited event was witnessed and documented. A symbiotic, functioning forest ecosystem, right here in the City of Philadelphia. We entertain ourselves with the variety of leaf types. The variability gives different plants their own personality. 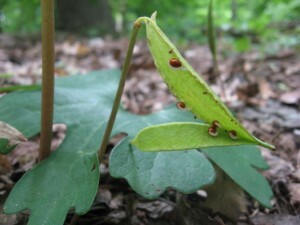 The leaf’s longevity eventually defines the plant’s enduring characteristics- by the late summer, the flowering stage has become a distant but fond memory. Violent thunderstorms with sudden heavy winds shake up many plants in Morris Park. Tulip Poplar (Liriodendron tulipifera) branches break off in great numbers, and in June, we get a bounty of orange and green flowers lying on the ground from broken Tulip Poplar branches. The heavy winds blow so hard we wonder why the plants dont break or bend completely down. We started to examine the stem of the Bloodroot plant more closely. The force of an animal, (usually an off-leash and unsupervised dog) could crush a bloodroot stem in a flash, halting its photosynthesis process of food production for the season and weakening its chance of flowering or even survival the following season. The heavy winds and even the gentle push of a persons hand or the brush of an animal can bring the stem and leaf to the ground and the plant can spring right back up, unscathed. 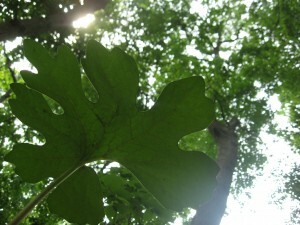 The stem is adapted to life in the summer forest with thunderstorms and sometimes the passing of an animal. We noticed that the lower portion of the stem becomes redder and redder as it enters into the earth. An entire season had nearly matured before we even had a chance to witness the plants namesake, the mythological root itself. We had seen pictures, botanical drawings, photographs of the red root with its many rootlets and old scars where previous years plants had emanated from it’s surface. One early fall day, walking on the path a short distance into the park from the house, we saw a disturbance in the soil alongside the path. A dog had dug into the earth and had uprooted some of the plants growing there. Upon inspection, the red roots were jutting out of the ground. There it was, the whole plant, the roots, and the tiny rootlets, with bits of rich black soil still attached. The plant was for the most part spared, however wilted from a full morning in the sun, extracted from the moisture of the earth. We marveled at the reality of the root before our eyes, open to inspection. A section was broken revealing the blood colored red sap. 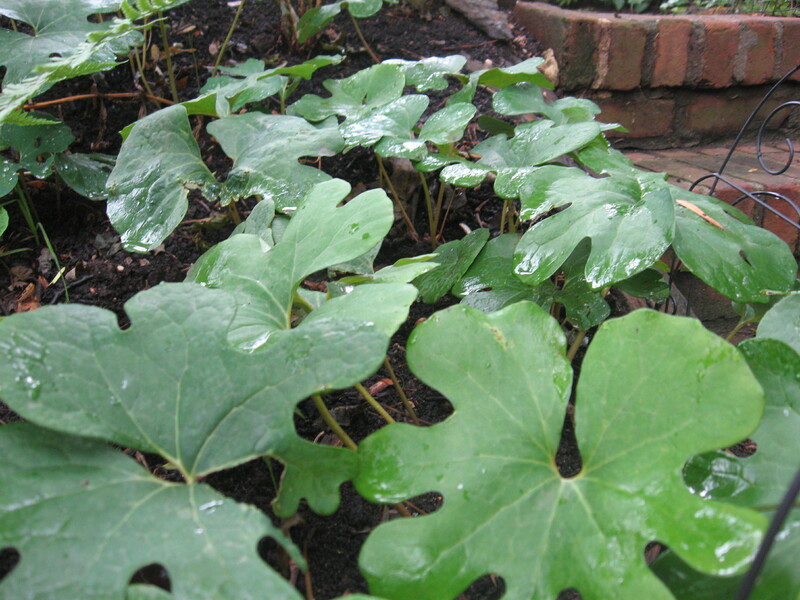 After our inspection we immediately planted the disturbed bloodroot, watered it, and monitored its recovery. It is doing well to this day, due to our intervention, one of many. We later learned that the fall is the best time to remove the root, break it apart and transplant it. If broken apart in such a way as to leave the newly created buds intact, with a few inches of root length in that section to provide the needed starch to grow the bud the next spring, there will be a benefit. The breaking of the root in this appropriate manner during the fall (also very early spring) will stimulate growth and bud production the following year, having the potential to increase the size of the colony. The orange-red root takes on its own form of being. It has a course quality to it, the way it winds and morphs in shape, its numerous hairlike rootlets going in every direction down can offer. There is a sense of movement to it, like a beetle or an ant, the rootlets could be legs and antennas, ready to scurry to better ground, to detect moisture, or to pull the root down into moisture. 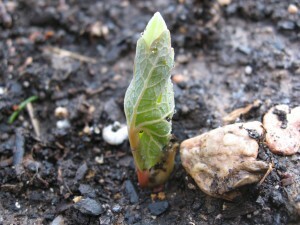 The root’s essence has a working quality to it, like that of a vessel on the sea, designed to persist time and weather adversity; storing the embryo of the plant throughout the winter in the stout and sharply pointed buds, and storing the starch needed to grow the plant within its dense, gangly, fleshy, cellular red mass. The plant is designed for just this situation. Like a ship at sea, it floats in a layer of soil that routinely experiences frost, bloodroot-appropriate levels of moisture, and sun exposure necessary for seed germination and cold exposure necessary for also seed germination as well as bud growth in the spring. This concept of necessary cold exposure , applicable to many of our green Morris Park friends, is known as Cold Stratification. During the yearly ice age, the root has no problem being lifted a few inches up as the ice forms. 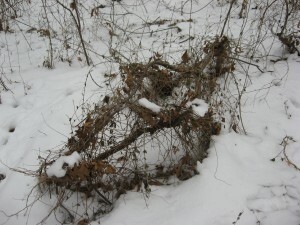 It is broken away from its rootlets, tossed about, and when the soil warms and collapses, the main body of the thick root and its several buds fall back into place ready to grow when spring arrives. What if the ice broke the root , shearing it into pieces? While it is possible a bud could be destroyed, more likely, this will actually benefit the root, which responds to division very well, stimulating an accelerated bud production the following season, increasing the size of the colony. 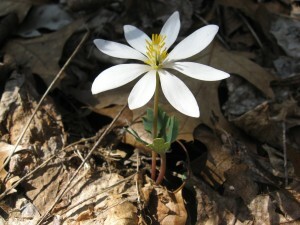 Bloodroot is one of the plants where root division benefits the plant’s reproductive capacity. Could it be possible that the spectacular and ground shifting ice event is just what the plant needs to enlarge its colony? That the plant is so efficient that it takes advantage of every seasonal extreme to further its survival? 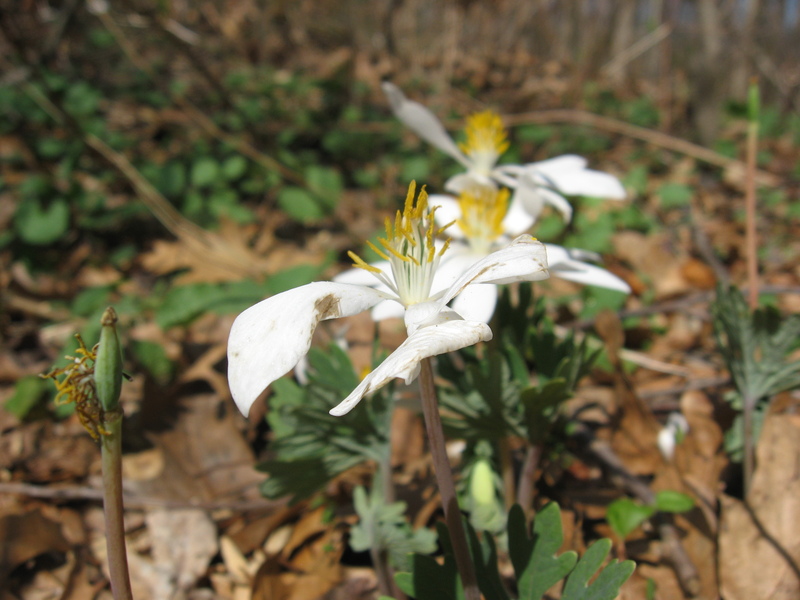 From the conventional understanding of the beauty of the flower, the inflorescence of the bloodroot has a special place in American folklore, its pure white delicate petals, its early spring arrival,and its ephemeral nature. It has a re-enforcing quality, after a long winter, such an exquisite flower can emerge from the earth, giving us the promise of a full season of natural beauty and productivity. 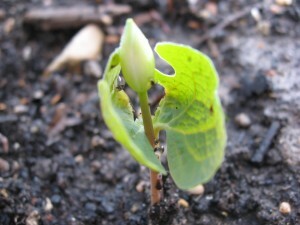 Pushing forth, the buds are using all of the energy resources available in the roots. The tiny clenched bloodroot emerges from the dark earth one spring morning, sometimes through layers of old snow and through piles of heavy wet dead leaves and broken branches. The leaf clutches around the tightly wound balled floral section as if protecting it from even the slightest damage that could beset the potential flower, and in the early spring, there is much potential for damage. If it is warm enough and there is sun, the leaf begins to un-clench and release the flower, which over a period of an hour or so, blooms, revealing its pure white delicate petals, and beautiful yellow stamens. The ravenous bees, which are ever so hungry, are in pursuit. Commencing is the age-old interaction of the species, the Flowers and The Bees (and as the season progresses, in its own terms, poetically translates into the Birds and the Bees). Here, in the atmospheric stage of the plant, we notice it and are attracted and pleased. The pure white petals appeal to our sense of aesthetics, their circular patterns, the way they meet at the yellow hub. The ephemeral nature of the petal contribute to our sense of intrigue, that something so beautiful lasts for such a short time. The context of the plants arrival into the atmosphere also contributes to its appeal; through the brown and grey matte of dead leaves and sticks, the flowers present a fascinating contrast to the random droppings the forest has shed. This contrast is part of the plant’s survival strategy, creating an image to attract the pollinating bees. Here, after a few years of experiencing this plant in its cycles of life, we must return to one more thought about the root, especially while we and the bees are ensconced in the beauty of the flower and all that it brings to our own life-cycles. Here it is, this, the life-giving root, what it is we do not see, nor do the bees, an earthbound form, covered in the soil, oddly shaped, with chaotic bumps, wet, in the darkness. The root itself is mysterious; science has analyzed its chemistry, and we have been warned of its poisonous qualities if ingested or rubbed onto the skin. It as been attributed to cures as well. Exactly what quantifiable economic, societal ‘good’ does this plant serve? Is it productive? poisonous to what degree? These questions have been tumbling for years, as many of our native plant neighbors have been under this same scrutiny. Still, it is the life-giving root, steeped in the darkness of the soil, through the cold ice and wet muddy spring, darkness all the while. We as humans are atmospheric in our daily rhythms, and the flowers that startle us, move our emotions, and enhance our appreciation of species and life are above-ground friends. Below the earth, we are not as comfortable, images of roots are not found on ancient carvings; their beauty is not exalted on the edifices of temples, cathedrals, and houses of state. This, the beauty of the earthbound, the Bloodroot, is not quantifiable. It seems to approach the unknowable, like that of death itself. Roots resonate to our atmospheric ideals and sensibilities as both the givers of life and our companions in death, the latter taking precedence, as if we become roots ourselves in death ‘pushing up daisies’. However, at the stage where only the root remains,the plant is not in death, but dormancy, an earthbound state that we have learned to appreciate and relate to. It must be noted that we as humans are at our best level of comfort while we are in our dormancy, covered with a blanket, sleeping, ensconced in peace, healing ourselves through bodily rest and an active dreamscape calming our conscious and atmospheric realm. The bloodroot, in its dormancy, needs the cold, the absolute inactivity. In the Springtime, this is the last thing we we want to think about. In this spring moment we are all bonded together, the bees, us humans concsious of and viewing the bloodroot flower and the bloodroot plant itself . The flower is refined and predictable, unlike the root. How can such pure white petals come out of the deep red raw root? And the exquisite and graceful leaf? Letting our experience with the Sanguinaria canadensis into our lives has made us appreciate the whole of the plant. The root is as beautiful as the flower. The root is there all the time, but is more difficult to see without disturbing the plant- but then again, if done at the right time, in the fall, disturbing the plant can actually benefit the plant. Nothing is so much life-affirming as the bloodroot, one of the earliest flowers to grace our woodland. The conventional goodwill towards the blooming bloodroot is exciting and heartwarming, the comfort flower of early spring. Lying down below the still cool earth is that old root making it all happen. While in the excitement of spring the root may not be fully considered, we must remember all that it is and has been, while we humans as well as the bees are intoxicated with the flowers. 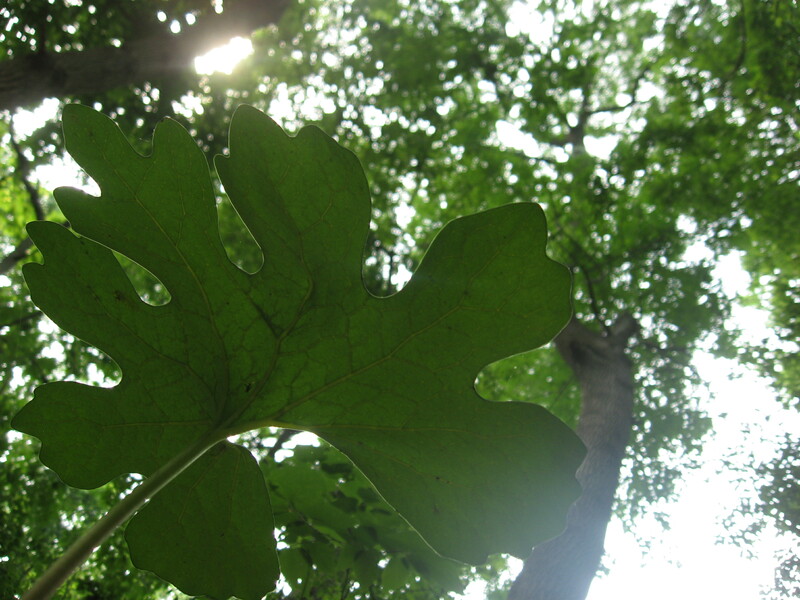 For us, just learning about Bloodroot has been a great way to begin understanding about the natural world in the Park- starting with the lifecycle of just one plant has been a great help in grasping the concepts behind the overall mechanics of the flowering plants. For example, pollination, genetic diversity, cold stratification, seed production and dispersal methods. These are the things that the plants in the woods of Morris Park share in common. Each one of them has a variation on how it conducts each activity. For example bloodroot relies on ants for seed dispersal, Witch Hazel, (Hamamelis virginiana) uses a technique of propulsion to expel the seed from its casing, shooting it out many feet from the parent plant. Witch Hazel blooms from November to December, at the very end of the growing season, while Bloodroot blooms in March, at the very beginning. These two plants grow in the same general habitats and have been for millennia. 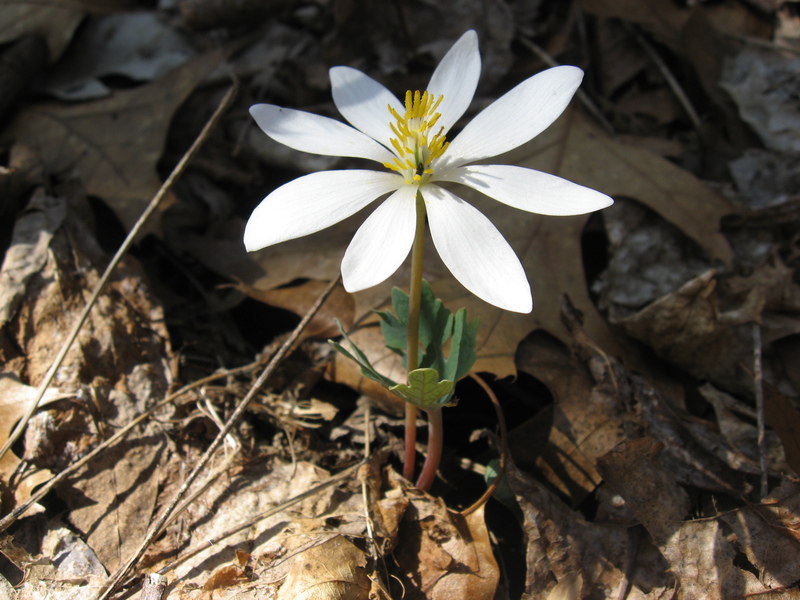 We have learned that Bloodroot is listed in The State of New York as “Exploitably Vulnerable” which means that if the current situation of environmental stress on this species continues, the plant will be in danger of extirpation in that state. This information comes as no surprise. In Morris Park, vast colonies of invasive plants cover acres, toppling trees and opening up once forested areas into open fields of broken dead trunks and masses of vines. 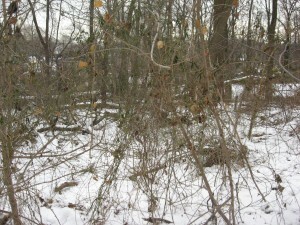 Impenetrable thickets of invasive brush are covered with invasive vines. Once mature but now dead oaks are laden with vines. 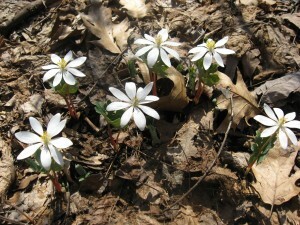 In these areas there is no bloodroot that we can see, or any other plant except the invading species. Just this past year of 2010, after 3 years of invasive removal in some of the worst areas of our site, we have witnessed the results of our environmental restoration first hand. All we did was remove the invasive vegetation. If we did not know what species the plant was, we left it alone until we could identify it. 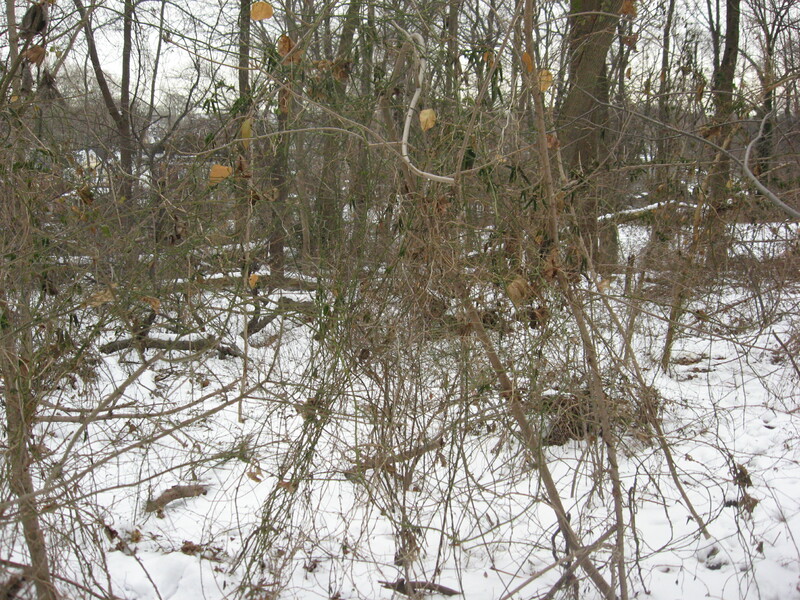 A whole area about 60 feet square was covered with Multiflora Rose that had Japanese Honeysuckle growing on top of it, creating a thick blanket of thorns and dense, stringy vines. After the lengthy removal process, the bare ground was left, which we covered with dead leaves and sticks, mimicking the forest floor, as if we had never been there. Spring arrived and summer, and we went back to the site for an evaluation, some of which was not a surprise: small plants of Multiflora Rose and Japanese Honeysuckle. A few other invasive exotics covered the landscape, such as Garlic Mustard ( Alliaria petiolata) Tree of Heaven (Ailanthus altissima) and wineberry (Rubus phoenicolasius). Being that this area had been a dense thicket of invasives, the few that remained required a maintenance hand-pulling to keep in control. What was most notable for us were the surprise native species that grew by themselves in this location. Maybe these plants were there before, or perhaps they were there in seed only, unable to sprout because the conditions were not right. The invasives were completely shading the soil from sunlight, and perhaps this is what stifled the natives from sprouting. Just to name a few, here is what is now growing in this once blighted area: Black Cohosh, Mayapple, Spicebush, Jack-in-the pulpit, Tulip Poplar (Liriodendron tulipifera),Sassafrass, Virginia Knotweed, oak and Black Cherry. And one other native plant came up in the middle of June, a delicate seedling, a tiny lobed leaf supported by a thin reddish stalk. 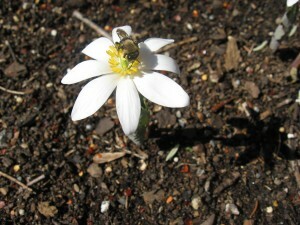 It was none other than Sanguinaria canadensis, Bloodroot. Welcome to The Sanguine Root.